hearts to give the light of the knowledge of the glory of God in the face of Christ. As we travelled from the bumpy roads of Indian villages to the maze of crowded city streets, we carried in our hearts the greatest treasure available to man—the Gospel of Jesus Christ. 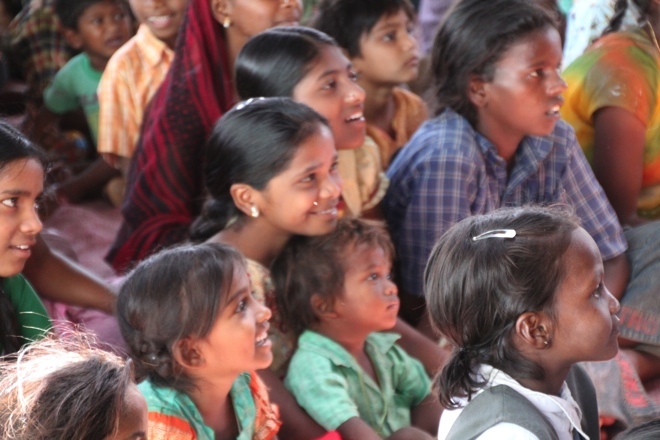 The joy of open doors to share this treasure with nearly 4,000 little souls in India is hard to explain. Can words describe the intensity of eyes fixed on colorful pictures of His life and death? Can words explain conviction of heart or transformation of soul from darkness to light, from death to life? My words fail me, only tears take their place as I recall the joy of three weeks spent sharing this treasure with God’s little Indian TREASURES! 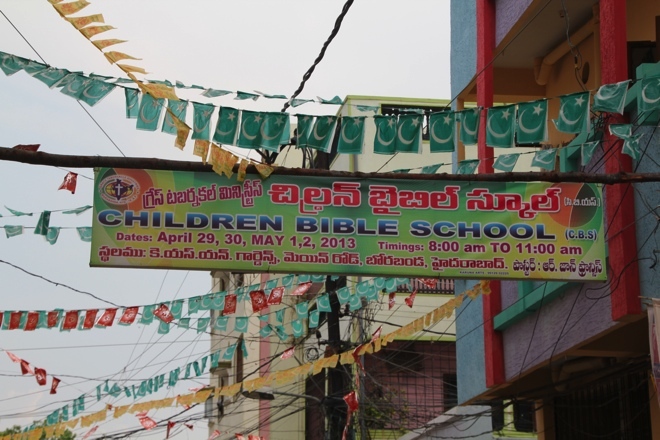 We visited 11 villages and did 2 four-day Children’s Bible Schools during our time in India. We were busy every day, and I loved the situation of having nothing to do each day but prepare for and execute the mission. The single focus is a blessing that we don’t normally find in busy modern lives. But the highlight of all the ministry had to be the open door into the slums. 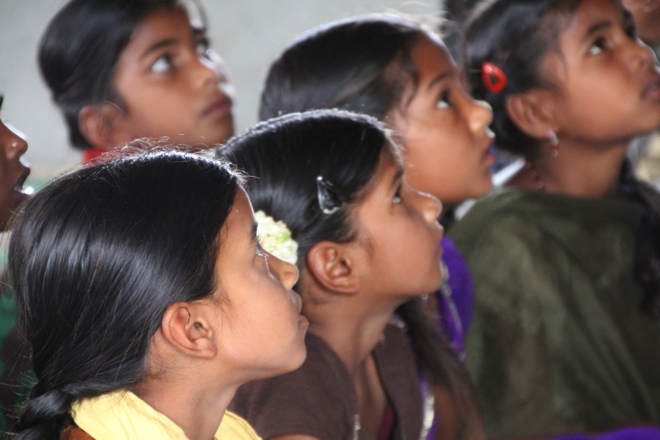 Since our first CBS in Hyderabad in 2001, I have desired to minister to the slum children and their parents. For several years, I repeatedly asked the pastor we work with for that opportunity. He always assured me that it was his desire as well but it never came into fruition. After many years I quit asking. 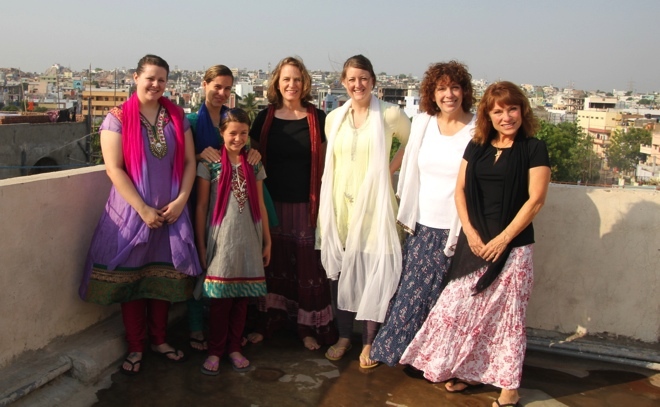 This year, Krystina from Cross Road Bible Church in Australia, joined our team in India. She had been to India a few times before in the early years of our CBSs there and remembered praying with me for open doors into the slums. 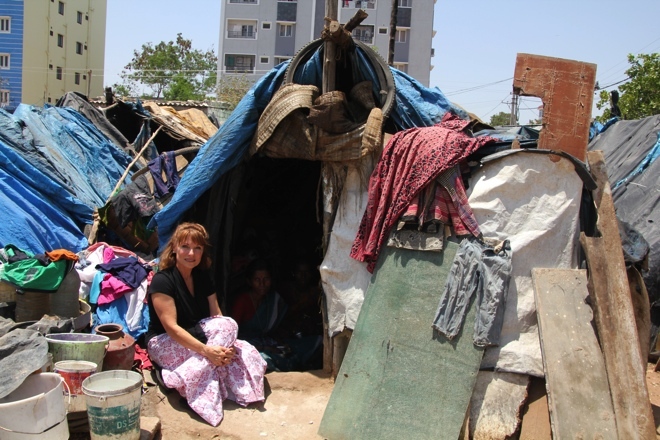 When she arrived in Hyderabad she asked, “Have you been able to go into the slums yet?” My reply showed my own lack of vision and faith as I said, “No, and I figure if it hasn’t happened yet it probably isn’t going to.” Enter, the faithfulness of God! The very next day the pastor told me that he now had a contact in the slum and would like to take us in to do a children’s program! God is faithful, God is willing, and God is able! Just as a bird gathers sticks and debris to build a nest for her young, so it is with the people in the slums. They live adjacent to a huge garbage dump that is the source of their existence. Combing through the huge mounds of debris they find little scraps of this and that to build their homes, clothe their children, and recycle anything of “value.” The dump is their livelihood and the center of slum activity. This is the filth of their everyday existence. 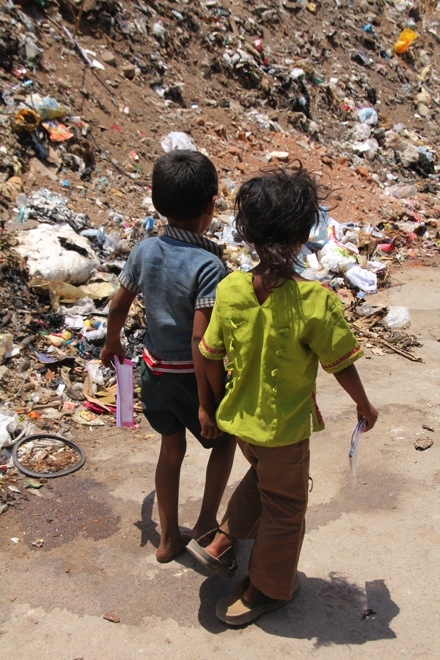 Other social problems such as drunkenness, violence, and abuse add to the despair of life in the slum. On a Saturday morning, Pastor JF and his church people were able to set up a meeting tent at the back of the slum and invite the children in. About 150 children arrived—some happy and fairly clean, some looking bewildered, disheveled, and dirty. All were eager to watch and listen. Krystina started by teaching a simple Gospel song, “One Way God Said to Get to Heaven.” I followed with “The Wall Story”—a fun puppet show that we often use as an opening to the Gospel message. Smiles and laughter showed their delight. From the puppet show, I transitioned into the simple and basic elements of the Gospel: the sinfulness of man, the love of God, and the work of Christ. Little dark eyes were fixed on the visuals as their hearts were fixed on the message. Kim then took over and gave a wonderful explanation of Heaven with beautiful pictures that gave hope of eternity with Jesus. We prayed with the children, telling them that if they had believed in Jesus Christ as their Lord and Savior, then join with us in telling God what is in their heart. Only the Lord knows the condition of their heart, but one head after another bowed with us in prayer and expressed faith in Jesus Christ. We then distributed laminated Bible verses for them to take home. In this picture, the little girl is moving her finger over each letter of John 3:16 and sounding out the words. We then handed out the “Jesus Loves Me” coloring books in their language and watched as they had a fun time coloring together. Some adults gathered at the back of the tent, just as eager to join in the coloring. As the children spent time coloring, one of the pastors asked if I would like to walk around. 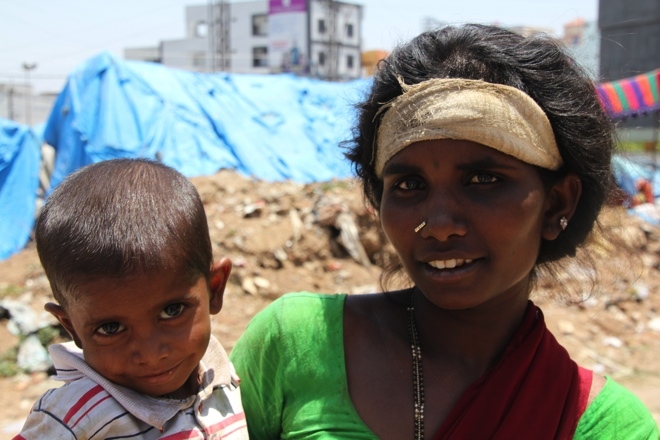 He took me through the long rows of tents, and I got a better look at life in the slum. I met women nursing babies, doing laundry with bucket and stone, carrying water, preparing meals over an open fire— daily life on display. In another area, a family was gathered to mourn the recent death of a son. A water truck delivered water, and arguments broke out over the rationing of the water supply. I felt emotionally crushed. As I returned back to the tent and the gathering of children, my mind returned to the treasure of the Gospel—isn’t this the only HOPE that any of us have to be delivered from the slum of a sinful soul?! After the coloring was finished, Janet taught the children a wonderful lesson on the faithfulness of God to provide for the lilies of the field, the birds of the air, and the little children that He created! Through the Word of God, the children were encouraged to trust in the Heavenly Father Who knows their every need. We had a beautiful little foam craft for the kids to do and then finished with a hot meal of rice and chicken curry. 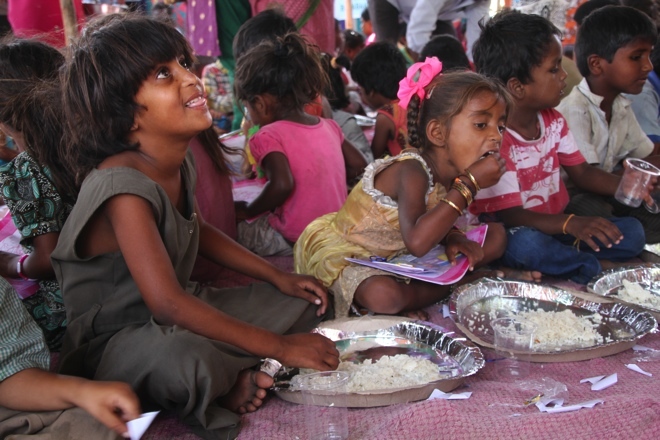 We fed about 400 people that day, as many parents came in to enjoy the hot meal. 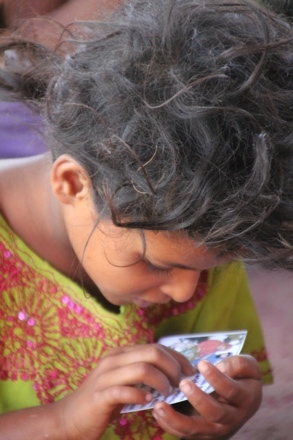 Please pray for the materials that were sent back into the homes in the form of Gospel tracts, verses, and crafts. Through the materials that the children bring home, we hope to reach the parents as well. Please pray that Pastor JF will continue to have open doors to work in the slums and minister to their physical and spiritual needs. 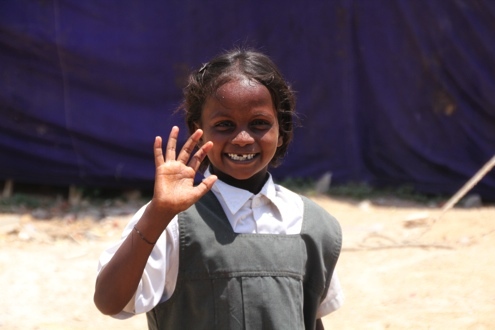 Though we minister to thousands of Indian children each year, there is still opportunity to know some as individuals. God desires to have a victory song in our lives, and I would like to share with you a couple of story “songs” from children in India. Isaac has been coming to one of our four-day programs for about the last 11 years. Many years ago, we gave out the “Where will you spend eternity” Gospel coins to the children. One of our faithful men at CRBC in Australia drilled holes in hundreds of coins and put a cord through them so that the children could wear them around their neck. I took a picture of Isaac (at the age of about 9) wearing his coin. The next year I gave him the picture to keep. Isaac has come every year since and still wears the coin! This year he was a helper for my senior class, and he brought the picture that I gave him years ago. I was astonished. 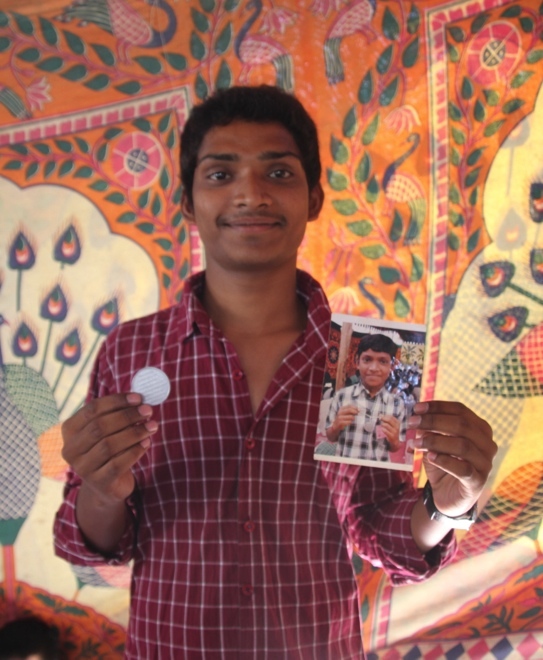 Now, at the age of 20, he still has the coin and the photo. I said, “Isaac, you still have the coin and the photo after all these years? !” His answer brought tears to my eyes and joy to my heart as he said, “Yes, Auntie. I have a drawer at my house and in the drawer I keep all of the things you have given me from all of the years. The books, the verses, the crafts—they are all still with me.” Now there is so much beauty in this because many of you reading this report helped to provide those crafts and books, printed, laminated and cut those verses, and prayed for that boy. Your fingerprints are in his drawer! Be encouraged by the fruit the Lord has brought from your service. Isaac is now a Sunday school teacher at his church and is preparing for the ministry. Solome has also come to our four-day program for many years. She is a young lady with a very tender heart for the Lord. Many years ago, she came to me with her mother and asked if we could help her in her poverty. She has a bright young mind and desired to go further in her studies but lacked the finances to do so. It broke my heart but I had to tell her we could not help financially (thousands in our sight are in the same position), but we would pray for God to supply her needs to continue her education. This year, she came to the CBS as a helper and I had an opportunity to hear her “song” of God’s grace. She is in her second year of college training to be a doctor. She said there are so many poor people in India who need medical help, and she wants to be able to help them—by God’s grace. He is supplying her financial and educational needs so she can in turn supply for others. God is faithful! The Lord does not delight in a one-man show but in using the Body of Christ in unity for a common purpose. My thanks go to Kim, Janet, Desi, Krystina, Jackie, Allie, and Mikel for the love, devotion, and expertise that they each brought to the ministry team. They all kept “their eyes on the prize” through travel delays, extreme heat, power and water outages, and long noisy nights. And they did it all with grace, beauty and laughter! The open doors we have in India come through the ministry of Pastor JF. He, his family, and church show us great hospitality and love as they welcome us each year to work alongside them in reaching the children of India. Please pray for them. And my thanks to each of you who so faithfully prayed and supported this work. God is able to take the pennies and nickels that go down the neck of the giraffe (thank you Abundant Life children) and multiply them to spiritually feed many hungry souls. Above all is the powerful effect of humble hearts on bended knees. Thank you for your prayers!